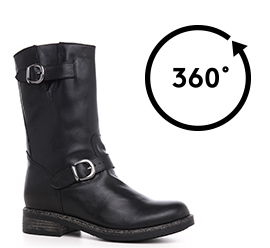 Handcrafted elevator boots in smooth black calfskin leather, decorative silver buckles, round toe and sole in natural rubber featuring a particular aged effect. Ideal to complete a casual-trendy style. An iconic boot which ensures maximum comfort and durability able to increase height by up to 4 inches (10 cm) in style and secrecy.